A messy desk in the entrance lobby of Bristol Central Library. On it are maps, ticket stubs, empty sweet wrappers and various other assorted paraphernalia that individually mean nothing but as a collection of objects signify a great deal about the person to whom this desk belongs. Also on this desk is a guidebook of China. And it is this that is the most important object. 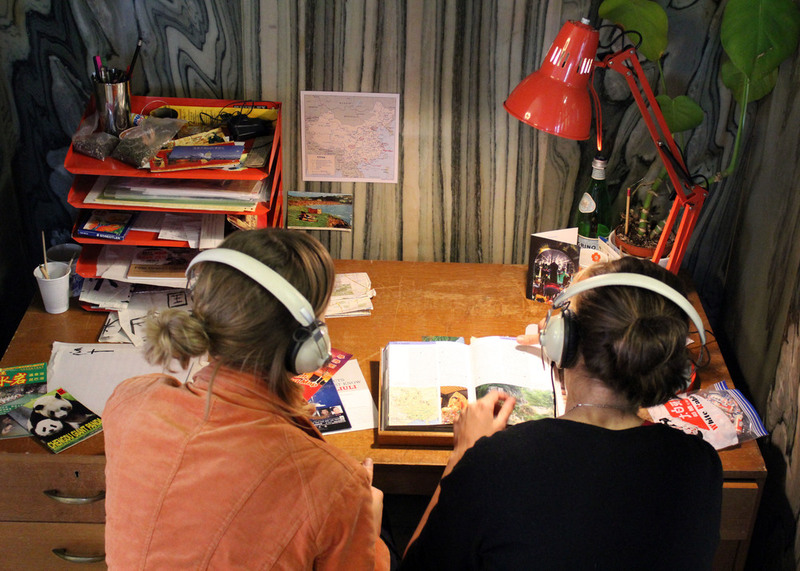 When you arrive for your 20-minutes or so of Turning the Page, you are instructed to put on a pair of headphones and leaf through the guidebook which magically comes to life for an intimate and moving sound installation. A woman talks about the experiences that she has had while travelling through China, with snippets often surreptitiously recorded as she sits in a bar and is befriended by a young man, or boards a boat and joins in with a mass singalong. If only all holiday snaps could now be outlawed and this be the way friends and family tell you about the brilliant experiences they have had in foreign climes. Which isn’t to mean that everything the woman says is brilliant. She is at times lonely and at other times close to tears, like when recounting the moment that a stranger wordlessly took her sketchbook and painted a watercolour – which itself magically then appears on the desk. Turning the Page by Stand + Stare and Professor Tim Cole from the University of Bristol is at Bristol Central Library during opening hours and is free, with no need to book. Click here for more information.